Wondering which plugin to choose from dozens of WordPress appointment plugin. Be cool, and check out our article, here we have picked the 11 best WordPress appointment plugins for your website. If you are running a customer-oriented business, it may be anything like hotels, restaurants, hospital, salon, beauty parlor, consultancy, pre-booking an item etc. scheduling the time is a key factor. Appointment booking plays a major factor for any website. It makes your website lively, and anyone can make an appointment a fix a scheduled time for their visit. Appointment booking form makes your website lively and connected with the customers. WordPress doesn’t have any inbuilt appointment booking features. 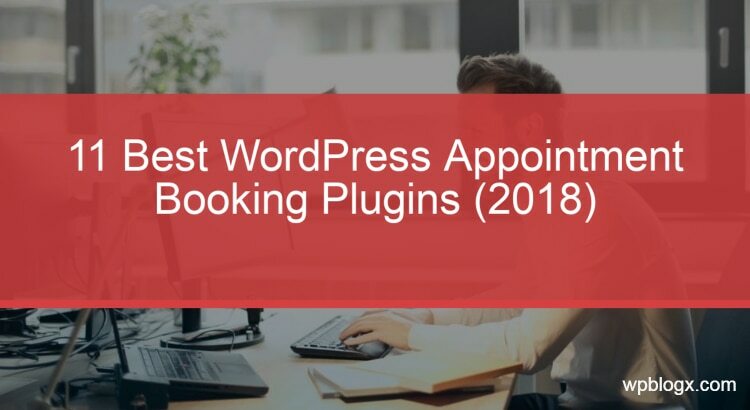 In order to increase your business revenue, as well as reducing the customers time and effort, there are numerous WordPress appointment booking plugins available. In this post, we will list you the best WordPress appointment booking plugins for your website. You can choose anyone based on your requirements and functionality. Bookly Pro is a highly automated scheduled booking system. This plugin is fully customizable and can be used with any devices. Actually bookly comes with two options free as well as paid. With pro version, you will able to remove the limitations of free bookly. It is one of the most responsive plugins and it’s design interface that attracts the customers. Allows you to manage an unlimited number of staff for a different schedule, and can be used for your office internal purpose. With this plugin, you will be able to color for each form, that turns your website colorful and attractive. It comes with an inbuilt form builder so that you can add different types of forms as per your website needs and can add custom fields to the form. You can get an Email or SMS notification, once the appointment is booked so that you can have a regular schedule based on that. In case if you want to cancel the appointment, you can easily do that through the confirmation notification which is sent to you. You can integrate this plugin with Google Calendar, and WooCommerce for sync. It also gives you an option of making payment online using Paypal, Stripe, and Authorize.net. This plugin supports multi-language, nearly 12 languages. The customer support is very flexible, you can get 24/7 support from the team. You can just play with the features in this plugin. You will be able to add on more upcoming features. Has a built-in analytics to check the complete report of bookings, cancellations, payment etc. Overall this plugin gives you a modern way of creating a booking system and considered one of the best WordPress booking plugins. Booked is a user-friendly and fully customizable appointment booking plugin for your website. It allows customers to easily book the appointment. This plugin, even allows the guests to book an appointment without registration. It gives you a responsive, and custom registration login form. With guests it all requires is just a name and email address for booking. With this plugins, you can add custom fields, create multiple calendars, time slots, and can accept paid bookings using WooCommerce integration etc. Here all the bookings and reservation are done through Google calendar and it is updated automatically. The notable feature of this plugin is that the whole database can be downloaded as a CVS file. It gives an email notification as soon as the appointment is made. This plugin gives you customizable color options to the forms so that it looks attractive on your website. It provides widgets option and front-end shortcode that displays the available timings to book the appointment. The booked plugin has a feature of enabling appointment buffering in order to avoid bookings that are been too close together and a quick way to block out certain dates such as holidays when booking cannot be made. They give you an amazing customer support, where if you come across any issue, just raise a ticket and the support team will contact you within 6 hours. The free support is up to 6 months. Overall this type of appointment plugin is very flexible and good enough to meet all your requirements. Amelia is a lightweight, comprehensive booking WordPress plugin. This plugin is considered as the enterprise level booking plugin. It is a new generation automated booking plugin for your WordPress website. Amelia is built using latest technology stack, modern design, and user experience techniques. This plugin has many built-in features, that is not commonly found in other booking plugins. It sets you to manage appointments at multiple business locations. For example, if you are running multiple spas, it sets the customer to book into the location they want to visit all from the central website. This plugin is very easy to install and use. Just with a few clicks you can activate this plugin and start using it. This plugin allows you to build your own appointment booking forms. Has wide features such as support for multiple staff, service extras, local currency, coupons, unlimited color and font options to design, email notification, image galleries and much more. An ultimate feature of this plugin will control all the appointments, payments, customer requests, schedule changes, and other data linked to the Amelia WordPress plugin. The special admin calendar view is the ultimate feature to control all appointments, payments, schedule changes, customer requests and other data linked to Amelia WordPress plugin. The calendar can be easily set up for your personal viewer preferences: monthly, weekly, daily and timeline modes, filtering by employee, location, service or service category. It is easy to make an online payment. Customers can easily book appointment systematically without spending much time and effort. Even users can save money working with this plugin. Birchpress is a professional online booking management plugin. It is mainly for service-oriented businesses like salon, spa, photographers etc. This booking plugin allows you to embed the appointment form directly to the post or page of your website. So that customers can see all the services, make a schedule and fix the appointment without any conflict. This plugin has a built-in form editor, that allows you to create custom forms as per your needs. This plugin is well coded and user-friendly. It gives additional functionalities such as multiple currency support, client management, support for multiple staff and services, has an option to assign staff to the selected services and locations etc. It has an online payment method such as Paypal receiving the amount from the customers. This plugin synchronizes your booking calendar with other calendars such as iCal, Outlook, Android, Google calendar etc. Has a feature to send notifications, and remainder system so that you and the customers can stay up to date about the upcoming bookings. Birchpress is multilingual, that supports multiple languages. It comes with free as well as pro version. Pro version comes with a plan of personal, business, and developer. Choose it as you required and enjoy the benefits of using this plugin. Booking Calendar is one of the ultimate free booking WordPress plugins. With this plugin, you can easily schedule and book dates for the trips, travels, events etc. This plugin is very easy to use and flexible. This plugin comes in a calendar view, that is helpful for you as well as for the visitors of your website. Booking calendar is fully customizable and has a responsive design which works fine in all the devices. This plugin will store the booking data in your database, so there is no third party involved to store the data. This plugin is very responsive, simple and helps you to manage booking system and calendar availability in a few clicks in order to avoid double bookings etc. The visitors can check the availability and make appointments for spa specific time or for specific days. Booking calendar comes with a booking form captcha in order to reduce the spam. You can enable or disable this feature. This plugin includes a PayPal method for making an online payment. This plugin allows your customer to search services for a particular date and make payment for their booking. Advanced booking solutions offer a more complete solution as they let you receive payments and use promotional features such as discounts and coupons. You can easily export and import this plugin. Once the booking is confirmed, a notification will be sent to the customer. You can customize the forms and design as per your needs. You can just install and activate it by adding shortcodes to your page. WP simple booking calendar is another straightforward booking plugin for your WordPress website. Simply create a calendar, and add it to post or page using shortcodes. This plugin comes with free as well as paid versions. This plugin is very simple and can be used for booking rooms, hotels, per day offerings etc. You can create a complete booking system with just a few a minutes. WP Simple booking calendar lets to book an appointment for the whole day, rather than booking for a particular time slot. This plugin has a booking widget, you can place it in your sidebar or any other widgetized locations of your website. With the free version, you will be able to keep track of all the bookings on your website. If you require additional features like editing, publishing, and sync to other calendar options, then it is required to go for the paid version. This plugin is multilingual and has a wonderful user interface. It will hide the booking history from the visitors and displays a legend near the calendar. Easy appointments is a very flexible, easy to use WordPress appointment plugin. This plugin is used to integrate the reservation booking on your WordPress website. You can manage the bookings easily for multiple locations, workers, services, and time zone. This plugin has a customization email notification. With the email notification, you can send confirmation and cancellation booking to the customers. This plugin is capable of supporting multiple languages and provides the sync with WooCommerce, Google Calendar, iCalendar. Customers can easily make online payment through Paypal. It has a responsive layout and custom form field support. You can easily add the form by inserting a shortcode to any page or a post. With this plugin, you can manage all the configurations of your booking account in a couple of minutes. Easy appointments is a worth plugin if your running a small scale business and planning to manage to book without any complexity. 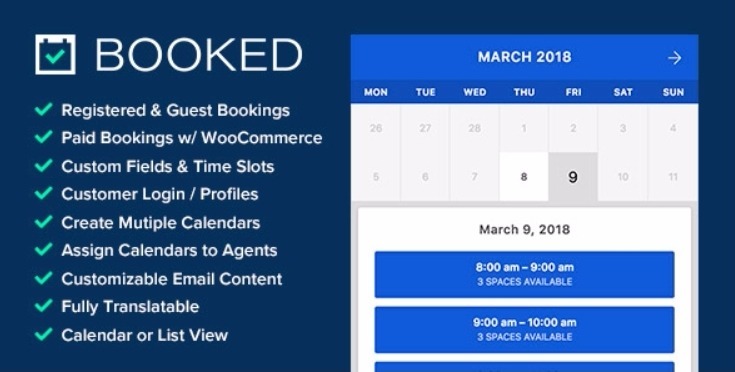 Booki helps you to create and manage booking appointments for your WordPress website. This plugin supports both appointments and reservation based bookings. Booki has PayPal integration for making payments and issuing refunds, a shopping cart and discounts via coupons with MailChimp integration. Can schedule an appointment and book for massage, haircut, meeting, parking, and many other services. It has an unlimited number of booking projects and service providers. Control how your calendar functions by selecting a calendar mode: Popup, Inline, Range or Next day checkout or Events. Will send an email notification to the customers in case of confirmation and cancellation of the booking. Customers can make an online payment without any conflicts. Enable both book now pay later and PayPal Express payments at the same time. It has unlimited options such as radio buttons or checkbox, dropdown lists, cascading lists etc. You will be able to set the remainder for booking appointments and the bookings are recorded in the back-end. Will be able to display the list of attendees and has unlimited google calendar profiles. Allows you to set minimum notice and prevent people from booking too soon, allowing you a minimum notice period to make arrangements. Webba booking is suitable for taking bookings for all types of appointments and arrangements. This plugin is a full-featured robust system. This plugin is mainly designed for service providers and helps to optimize their time while providing comfort for the customers. Webba provides much more features and has a good experience for both the providers and customers. This plugin has a Google calendar two-way synchronization, that can be done in real time. Setup reservations effortlessly and rapidly and let the customer book arrangements on any gadgets with an orderly basic booking process. With this plugin, you can customize the design and working of the booking system to fulfill the requirements. You can even add custom fields, create unlimited schedules, and designs as per your needs. You will be able to send email notifications and remainder to keep your customers engaged. Customers can make online payments through Paypal and Stripe and gives you plenty of options for collecting and managing transactions. Webba Booking is fully equipped with notifications. It takes care of familiarizing the customer and the administrator about every booking. vCita is actually a popular software development company that provides amazing solutions and this plugin is not an exception. It is a free booking plugin that gives the customer an easy solution to book appointments online. Allows to book one to one appointments or even for the group events and classes. With the help of this plugin, you can increase your business. vCita also offers Mobile App for Android and iPhone devices, so that you will be able to respond to the customers real time. This plugin is multilingual as it supports many languages. vCita is fully customizable and have a lot of features including mobile notifications for the customer’s requests and sets an automatic reminder for customers. vCita WordPress form builder plugin goes beyond the traditional contact form and offers an optional archive for contacts and client communications, text (SMS) notifications for new form submissions and much more. Once booking is complete, vCita Online Scheduling Software will automatically send both you and your clients a confirmation email as well as text message reminders, simplifying coordination of scheduling and rescheduling. vCita helps you track client communications, appointments, and payments, maximizing your client relations efforts and contact management. This plugin connects to your WordPress account. You will be able to create a vCita account directly from the plugin, and the free trial plan is for 14 days. HBook allows you to easily enable online reservation for your WordPress website. This plugin is most suitable for businesses like a hotel, holiday apartments, campsite, B&B etc. This plugin can integrate and sync with third-party services, including Airbnb and HomeAway, as well as Google Calendar and iCal, to keep your bookings up to date across all the platforms you are working with. You can also easily export your bookings for use elsewhere in CSV format for viewing and manipulating in software like Excel or Google Sheets. With this plugin, you can set the rate based on the number of people included in their booking, options for offering discounts, multiple seasons and much more. Share table rates and let them complete the deal with a beautiful booking form. This plugin is well documented and offers you a good support. It is been regularly updated, so no need to worry about its being outdated. This plugins support team is available 24/7, anytime you can reach out to them if you come across any issue. Make your hotel, hostel, motel or any other business in the industry appear even more professional on the web. Below listed are some common features of booking plugins that are listed in this article. Few features may or may not be present in the listed plugins. It’s a key point to remember that before purchasing any plugin, please go through its features and check whether its functionalities suits your website. Also, many of the WordPress appointment plugins come with the payment functionality which is integrated with Paypal, Stripe etc. All the above-mentioned WordPress appointment booking plugins are analyzed well and made a top pick of 11 plugins. Each of the above-mentioned plugins gives you a modernized way of the booking system and makes your website look wonderful and user-friendly. These plugins make your website more lively and let you connect with the customers and increase your business. Hope you got an idea about the best WordPress appointment booking plugins. If you come across any other best plugins that are not under this list, please share it with us, so that it might be helpful for the beginners. If you have doubts, please feel free to reach out to us. You can subscribe to us at Facebook and Twitter.